Hawaii’s got one of the largest non-public hydrogen stations around, located at Joint Base Pearl Harbor-Hickham, but until now the state’s never had a public hydrogen station. The state’s Toyota distributor just changed that. Servco Pacific has opened a public hydrogen station to serve what it hopes will be a spate of Toyota Mirai fuel cell sedan lessees on Oahu. Hawaii’s first public hydrogen fuel station is in Honolulu. Hawaii is the second state in which Toyota is marketing the Mirai. The first, of course, was California, where almost all of the nation’s handful of public hydrogen stations are located. Fuel cell vehicles are electric cars that use compressed hydrogen to store the electrons that the fuel cell stack turns into electricity. The fuel cell stack replaces the traditional bulky and heavy battery pack of a conventional battery-electric vehicle. 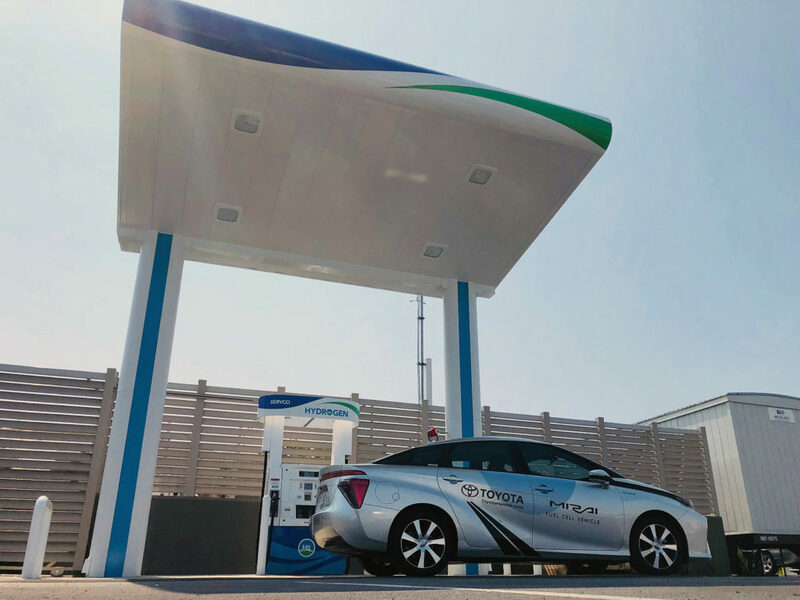 And because compressed hydrogen can be pumped into vehicle’s fuel tank about as quickly as gasoline is pumped, fuel-cell electric cars don’t have the range limitations of battery-electrics – as long as there are hydrogen stations available. The Hawaiian hydrogen station is located at Servco’s Toyota Honolulu dealership. It makes its own hydrogen with a solar-powered electrolyzer, using water and sunshine, plentiful commodities on Oahu. The system runs on grid-supplied electricity when it is cloudy and the sun isn’t providing enough energy. Honda and Hyundai also market fuel-cell electric vehicles, although so far only in California. The new Hawaiian hydrogen station might change things, though. Honda’s is the Clarity FCEV sedan. Hyundai is winding down its Tucson FCEV program and will replace the fuel-cell Tuscon crossover with a new model, the Hyundai Nexo crossover, that was designed form the ground up to be a fuel-cell electric car. The Nexo is due at the end of the year as a 2019 model.